snowdeal.org > ex machina: the eric update - day 1062: odin, looking at his mamma, holding a very special peony. 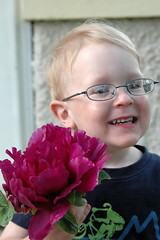 the eric update - day 1062: odin, looking at his mamma, holding a very special peony. after a long day of helping in the yard, digging holes, hauling straw and compost and planting plants and just before a very necessary bath, kris walked in the house with her hands behind her back and asked odin to close his eyes and hold out his hands. "i have something very special for you." "poppi, i would like to sit on the front porch with my flower. can you take my picture?" "odin, of course i can."